This little shawl would have to be one of my fastest knits this year (mug cosies excused because they are tiny!). I cast it on at my craft group when I was in need of a travel project that I could take along. The project had to be something that was easy to knit whilst having a conversation and easy to pick up again after being interrupted, because let's face it, at a crafting group one usually spends more time socialising than crafting! 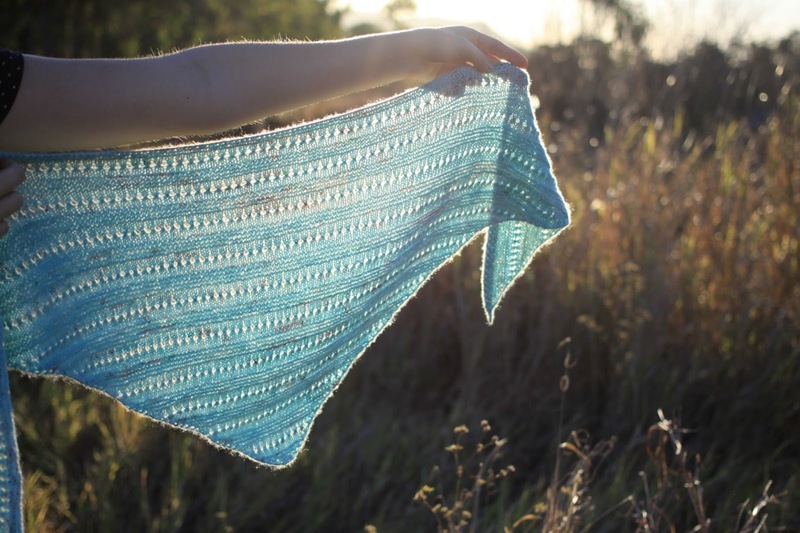 This pattern fit the criteria whilst also being something that wouldn't be too boring to make, use up most of the 400m skein of hand dyed yarn I had and most importantly, be something I would enjoy wearing at the end. I've carefully observed over the course of this winter how I use my shawls and scarves so that I know what best to knit for myself in the department. I knew this little shawl - which should probably really be called a shawlette, would function like a scarf on very cold days and on not-so-cold ones, be a good size to just keep the top of my back warm. I wanted to be able to wear my shawl a few times before winter left us, and with the beginning of Spring so far proving to be rather cold (except for late afternoon), I've worn it plenty of times already! I really enjoyed this pattern from Ann Alger. 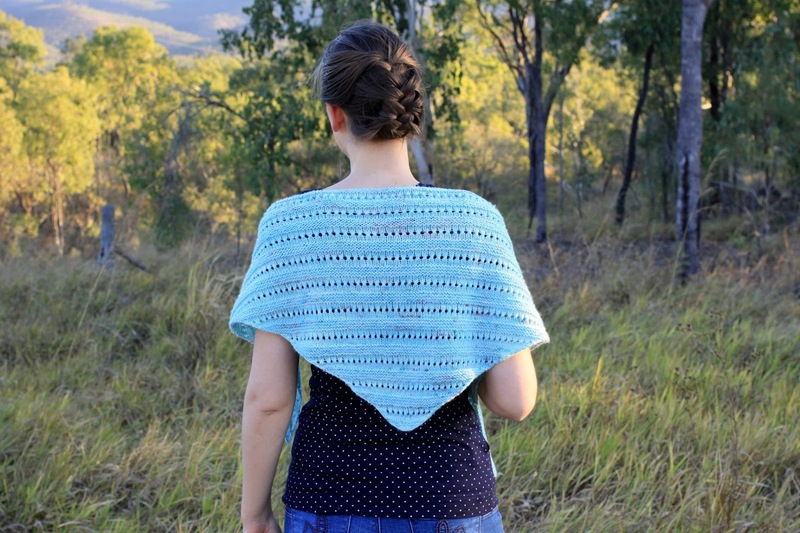 It was very easy to get going with and after a few repeats of the stitch pattern I had memorised it, and even knitted the entire shawl without using a row counter as it was so easy to track where I was up to. Just so you know, I'm shocking at memorising patterns so if I could memorise this one a beginner probably could! I'm also a stickler for using a row counter but I really didn't need to with this. The shawl was worked from the bottom up, which was great as I only had the one skein of yarn and I didn't have to worry about running out. I opted for an extra repeat of the pattern at the end to make the shawl a little larger, but because I decided to do that I had to make the garter stitch border at the top a few rows narrower. I was happy with that though because I'm personally happier with an extra row of the pretty eyelets than a thick garter stitch top. Overall it was a fun, easy little knit and I'm actually missing having this kind of project on my needles after casting off! I loved being able to pick it up anywhere at any time and do a bit of work on it. It's lovely to wear though, and I'm surprised by the number of different ways it can be worn. I wore it out unblocked the morning after I'd cast it off, and laid it out to block later that day. It's quite amazing the difference blocking makes to shawls. Before blocking it was curling at the top a little and the bottom wasn't sitting in a nice point like it's supposed to. So far it's holding its shape really well after blocking even though I've been wearing it heaps. 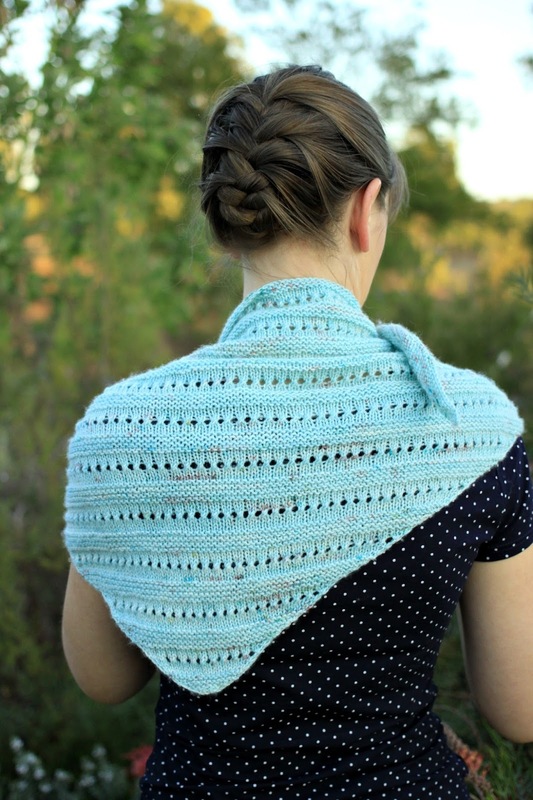 Have you made a shawl like this before, and what do you think of it? So pretty and lovely colours ! It's gorgeous! Love the colour and it looks perfect. It looks lovely! 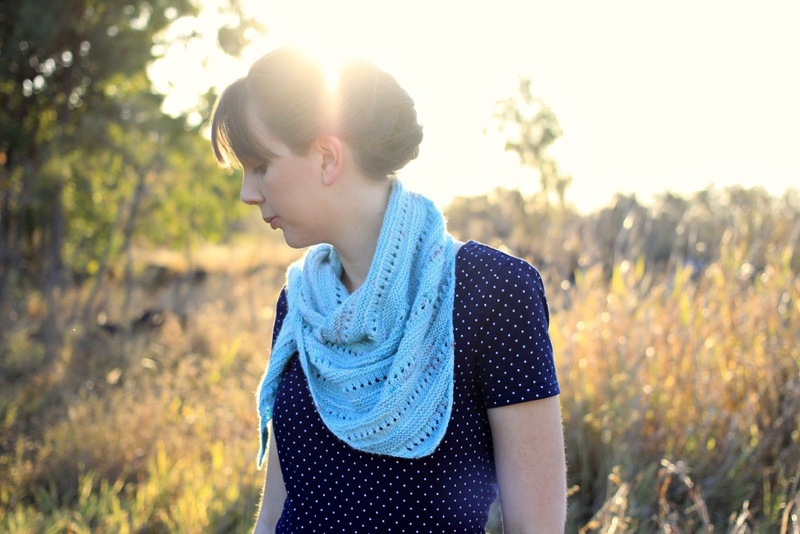 I've never been into shawls for myself, but after seeing the photo where you have it looped around your neck almost like a scarf, I think I've changed my mind. I'm knitting myself a cable and lace t-shirt in cotton at the moment and hoping the weather will have warmed up enough to wear it by the time it's done! Thank you so much Katie! Shawls are very versatile and there are so many different kinds. This one functions mostly like a scarf for me as it's quite small. Your shirt sounds lovely! I'm knitting myself a cotton lace top at the moment too, in anticipation for the warm weather. 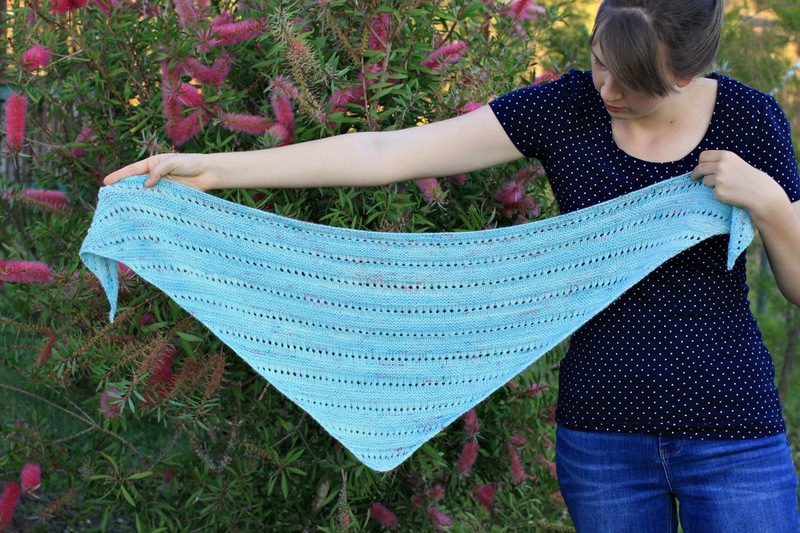 What a cute little shawl! I really like it styled as a scarf!